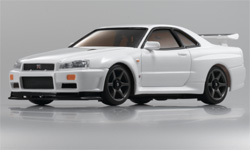 Kyosho Mini-Z Nissan Skyline GT-R R34 V spec II Nur MA-010 ReadySet - White. Points Earn 159 points when you buy this product! This is a great car. I personally own one of this and I find it one of the best car around. Very affordable and worth the money to buy. This car is excellent comes with a free white Nissan Skyline body case. Everything are ready to be run and it is a stock AWD. The parts in the car be used to upgrade to a better parts. The price is very affordable as the retail price goes from $239.99 to $259.99 and on TinyRC.com they sells it for $159.99 the cheapest. I personally recommend the AWD if you want more strength and endurance comparing to the MA-02. 5 stars for this!